Restore Lost Camera Quality in Samsung Galaxy Phones, In this post I’ll be guiding you with you a way through which you can regain the lost camera quality in Samsung Galaxy Smartphones after installing Custom ROMs. Whenever we install Custom ROMs in the Samsung Galaxy Smartphones, the TouchWiz Framework is replaced by another Framework depending on the ROM we install. Due to that the Hardware isn’t able to interact with the Software properly causing many issues. Same thing happened with me and happens with many people, When I installed a Cyanogenmod based Custom ROM in Samsung Galaxy S3, The Camera quality was lost. I did manage to get the Samsung Galaxy Camera APK file and tried installing it on a Samsung Galaxy S3 (Omni ROM) but wasn’t able to install the app and gave me an Unknown every time I tried. We cannot install the Samsung Camera app unless we have TouchWiz Framework in our phone. So what? How did I get back the camera quality? 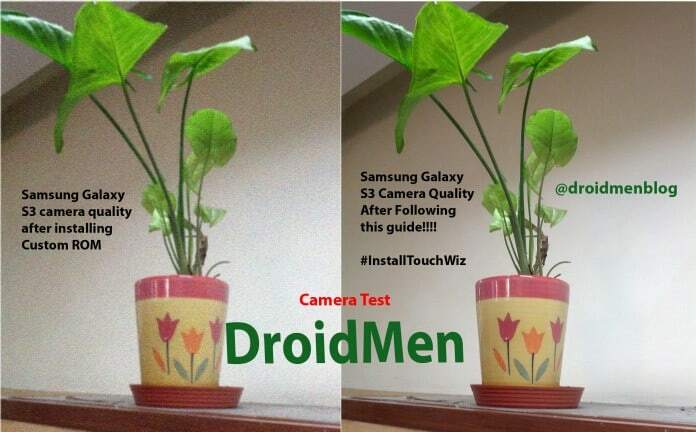 Continue reading the post to know How to get back the lost Camera Quality in Samsung Galaxy S3 or any other Samsung Galaxy phones. How to restore Lost Camera Quality in Samsung Galaxy Smartphones? This post assumes that you are already aware about the relationship between the User Interface Framework and Hardware components if you have skipped the above paragraphs and are reading this directly then I request you to navigate above and read about it so that you can understand the reason behind it and get a clear idea of what we will be doing! How to find a Samsung based custom ROM? To find a Samsung based Custom ROM, Make a Google Search of the device model number. If you are unable to find then Comment the model number below and I’ll find one Samsung based Custom ROM for you. If there are no Samsung based custom ROMs and if you still want to get back the Camera Quality back then you can find the Stock ROM for your Smartphone. If you are unable to find any of the ROMs then feel free to comment below the model number and we will send you the link of the ROMs which are available for your Samsung Galaxy Smartphone. Well, the flashing part differs from one phone model to another phone model, the common way to install a ROM, is downloaded the ZIP file of the Custom Rom or Stock Rom and copy or send it to the SD card and then Reboot your Smartphone into recovery mode. Don’t know how to do it? It is just the combination of some keys in a sequence, else you can Reboot your Smartphone into recovery mode without pressing buttons and then Install the zip from the location where you copied in your SD card. If you are successfully able to install the correct ROM then you are done! You can now capture an Image and check the Camera quality, you would be shocked by seeing the Camera quality once again on your Smartphone! Previous articleHow to Reboot into Recovery Mode without Pressing Button!